The updated interface is wonderful. I also really enjoy the new Engagement Studio when compared to the older drip programs. It’s powerful and automation rules, dynamic content, drip campaigns and more really add a lot to your marketing department. Cons: It can definitely be pricey. Pardot can be very powerful. It can do quite a bit, including manage email marketing, lead segmentation, lead tracking, lead scoring, nurture campaigns and more. Best of all, it syncs perfectly with Salesforce. Have a plan and make sure you utilize this fully. Also, ensure Marketing and Sales are aligned and communicating. The updated interface is wonderful. I also really enjoy the new Engagement Studio when compared to the older drip programs. It’s powerful and automation rules, dynamic content, drip campaigns and more really add a lot to your marketing department. Cons: It can definitely be pricey. 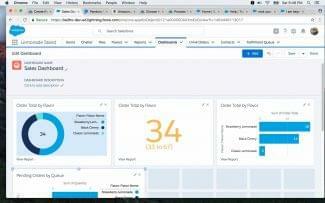 Pardot can be very powerful. It can do quite a bit, including manage email marketing, lead segmentation, lead tracking, lead scoring, nurture campaigns and more. Best of all, it syncs perfectly with Salesforce. Have a plan and make sure you utilize this fully. Also, ensure Marketing and Sales are aligned and communicating. All of the functionality. The flexibility and the ease of use (once you have been trained) It took us a bit to get trained on the tool, they way they use terminology and how they have things set up are very different than what most tools utilize. But once you understand the lay of the land it is super easy to use and set up. We were already using Exact Target and SalesForce. Adding Pardot to our suite of tools has really elevated what we can do for our B2B marketing. After the initial learning curve (plenty of vendors to help with training if needed) once we got up and running this has freed up so much time to focus on other areas but it has also GREATLY increased our leads, the value of our leads and our conversion rates. The tools is pretty easy to use one you get the lay of the land! It took us a bit to get trained on the tool, they way they use terminology and how they have things set up are very different than what most tools utilize. But once you understand the lay of the land it is super easy to use and set up. We were already using Exact Target and SalesForce. Adding Pardot to our suite of tools has really elevated what we can do for our B2B marketing. After the initial learning curve (plenty of vendors to help with training if needed) once we got up and running this has freed up so much time to focus on other areas but it has also GREATLY increased our leads, the value of our leads and our conversion rates. The tools is pretty easy to use one you get the lay of the land! Being working with so many tools for different purposes and learning ASAP is a tough job, Pardot is one of the tool which is very well designed in terms of using it, configuring it and getting ready for the end users as well. I find Pardot to be feature rich. The problem, however is the logic used when they programmed it. It is difficult to remember how to perform simple functions like simply create an email and send it. As I said they are feature rich though. If you want to schedule something you have to count the days out and then the hour you want it sent and then schedule it. This is simply idiotic. It is powerful in the sense that it has great templates, pretty good customization features, and it does interface with SFDC. Powerful features and customization options. Really good support! Great options. UI is marginal, and the difficulty in doing simple tasks. Dig deeper when looking at Marketo, Pardot, and Elonqua. They are all pretty close in functionality, it is just how they handle the most routine tasks. I find Pardot to be feature rich. The problem, however is the logic used when they programmed it. It is difficult to remember how to perform simple functions like simply create an email and send it. As I said they are feature rich though. If you want to schedule something you have to count the days out and then the hour you want it sent and then schedule it. This is simply idiotic. It is powerful in the sense that it has great templates, pretty good customization features, and it does interface with SFDC. Powerful features and customization options. Really good support! Great options. UI is marginal, and the difficulty in doing simple tasks. Dig deeper when looking at Marketo, Pardot, and Elonqua. They are all pretty close in functionality, it is just how they handle the most routine tasks. Easy to pick up quickly Sync with CRM can be complex. Lots of details. Make sure you are involved in the integration from the start. I’ve used Pardot in the tech and manufacturing industry and have found the tools to be intuitive, easy to grasp and accomplish what I need to do (build campaigns, generate leads, nurture prospects and enable sales teams to close more business faster. Use it daily. Make sure your reporting is accurate right off the bat. Sync with CRM can be complex. Lots of details. Make sure you are involved in the integration from the start. I’ve used Pardot in the tech and manufacturing industry and have found the tools to be intuitive, easy to grasp and accomplish what I need to do (build campaigns, generate leads, nurture prospects and enable sales teams to close more business faster. Make sure your reporting is accurate right off the bat. Pardot was founded in 2007 by David Cummings and Adam Blitzer with an original model of a pay-per-click arbitrage platform to generate leads for B2B marketers in the technology space. The company soon pivoted into B2B marketing automation aimed for small businesses with expanded marketing features, including email marketing; by 2012, Pardot was included in the Inc 500 as the 172nd fastest growing company. That year, Pardot was acquired by ExactTarget for $95.5 million; in 2013, ExactTarget was acquired by Salesforce.com for $2.5 billion. The Pardot platform offers considerable B2B marketing automation tools for lead management, email marketing, drip campaigns and custom automations. It integrates very well with Salesforce and its related platforms along with other major CRMs, such as SugarCRM, Dynamics 265 and NetSuite. Pardot makes it a little difficult to ascertain which features are included in each plan. This may be a sign of an effective marketing and sales strategy – keep prospects speculating until they commit themselves to a guided tour or demo – with the added benefit of avoiding a potentially superficial 1:1 feature comparison with other marketing automation providers. Inscrutability of their platform to outsiders aside, given Pardot’s reputation in the B2B marketing automation space, they surely know their craft. Exploring the platform through guided tours and browsing user reviews gives a sense of the powerful customization Pardot grants its users over their marketing assets, from simple things like fields and tags to complex system automations for personalized drip campaigns and lead scoring, as well as native integrations with some of the most expansive and best-resourced CRMs on the market. Pardot offers users considerable tools for managing the customer experience depending on how they interact with your site – marketing email, white paper, Google advertisement or so forth. Marketing elements can be segmented, organized and nested according to campaigns and workflows, customer engagement can be tailored to account for previous interactions, triggers and sub-triggers can be customized and timed across multiple channels. The advanced plans offer greater scope and depth of features – increased SEO assistance, more automation rules, greater API access and increased security and support. Businesses that aren’t tied into the Salesforce network of products would find it difficult to create custom integrations between Pardot and third-party applications – the API only becomes available on the Pro plan, which costs $2,000 per month (for up to 10,000 contacts). If a business is immersed in the Salesforce universe, Pardot is an excellent option for B2B marketing. 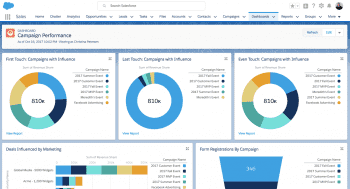 Companies can integrate Pardot with Salesforce Engage, which is a CRM plug-in that gives direct access to Pardot’s marketing insights for sales reps, for $50 per user/month. For companies looking to align their marketing and sales departments, particularly those already invested in the Salesforce ecosystem, Pardot is a powerful, highly customizable platform.